Also: there’s new bonus art in the photo album on the Facebook page! Go forth and behold it. Welcome to a new storyline! I will have new installments of this storyline for you on Wednesday and Friday. After that, we may go back to the usual Tues./Fri. update schedule for the rest of the storyline, but I’ll keep you posted down here in the notes. Remember, you can catch every update via Facebook or Twitter. I hope this comic is as funny to you as it is to me. I’m back from vacation and ready for another year of Sketch Comedy. Depending on what you mean by “ready,” I mean. In some respects I am completely unprepared. Still, I’ve got some exciting plans ahead for the comic, and I’m jazzed for a new year. I wanted to give props to God, without whom I would not be here, in this chair, typing these words about this webcomic. I would also like to thank Brian, Owen, Matt, and Brad for their awesome guest strip contributions, which allowed me to take some much-needed time off from the internet in general. Now that I am back on the internet, I have been able to respond to your comments on their guest strips! If you would like to see what I said and/or continue the commenting, just start at Brad’s guest strip and work your way forward. 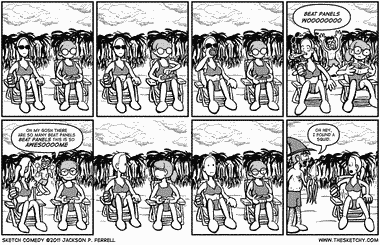 Brian Russell of The Underfold delivers the goods with this guest strip. The Underfold features a self-insert cartoonist and his friend having geeky movie-parody adventures, with periodic breaks to lampoon popular culture. Strips were originally drawn on the underside of the index cards labeling the coffee at Brian’s church, hence the comic’s name. It’s a lot like Sketch Comedy, which as you already know is awesome, so you should give it a visit. One of my favorite segments is the one where Brian and JB visit alternate dimensions in a phone booth. 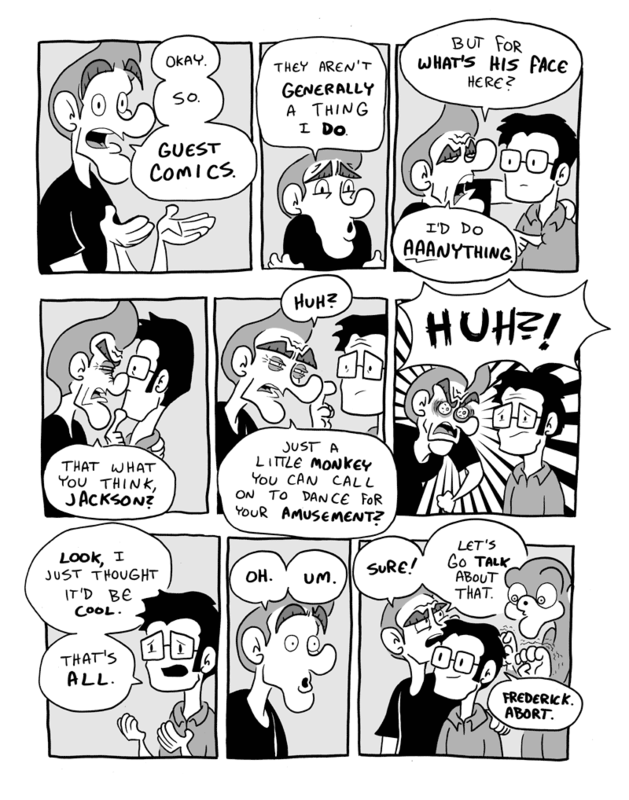 The two men in the guest comic are Abe and Mr. Pennybags. Is the wizard Howard? Owen Heitmann brings us today’s guest strip. Owen has various collections of his comics at 24hourcynic.com, but as you might have gathered from his guest strip, he likes to push the envelope–and some of the strips in his archives are Not Safe For Work. The main page is safe to visit, but please browse with discretion! I can, however, give a solid endorsement to his all-ages newspaper-style strip Basic Wage Kids. It’s about three roommates and their band: egomaniac frontman Skip, meathead drummer Stu, and angry bassist chick Emma. Does it have metahumor? Yes. Does it have puns? Yes indeed. And does it have punk rock references and just enough edge to keep the newspaper-strip humor interesting? You bet. It’s complete (read: no longer updating), but there are over 400 strips to check out in the archives, so give it a look! 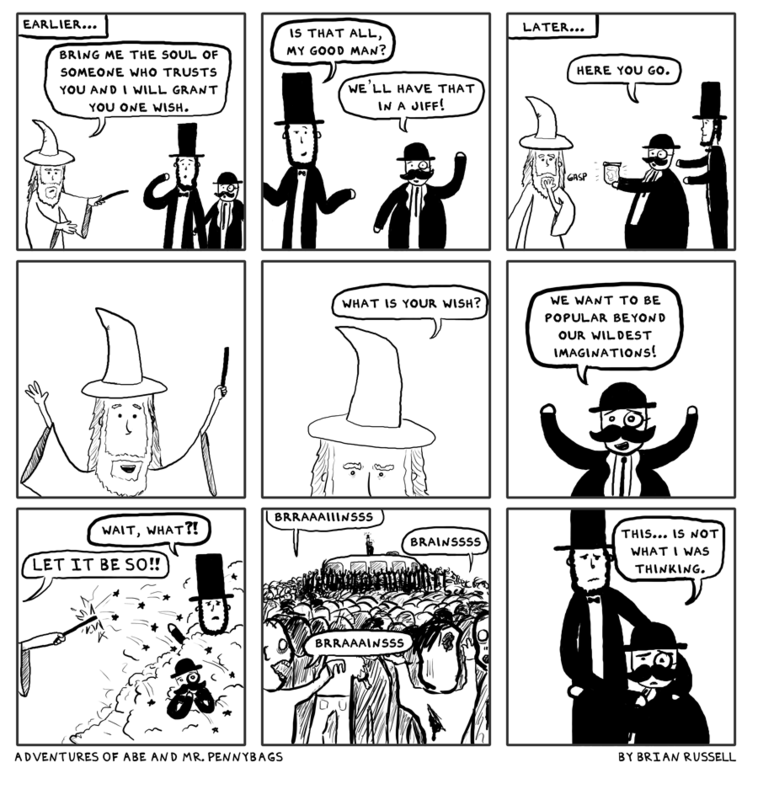 Today’s guest strip is brought to you by Matt Rizkallah of Bloggy Bloggerville. I post it not because it is a breathtaking masterwork of genius, but because I can’t understand what’s happening. Are there two distinct people, or does the one man travel back in time to shoot himself? 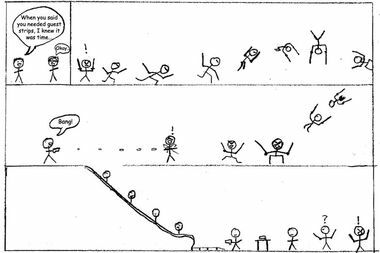 I am pretty sure it’s Matt and me in the first frame, but beyond that…does anyone know what’s going on here? Anyone? Brad Pugh of Okay So Comic kicks off our guest strip onslaught. If you like comics about making comics (which you do, because you read Sketch Comedy), then you will like Okay So Comic. It is a comic about a guy making a comic! It is currently on hiatus, but Brad has a new secret project that he recently launched at roboneko.com. What I’ve seen looks pretty slick, and I look forward to checking it out more closely once I get back from vacation. In summary, Brad Pugh has a bizarre sense of humor, his comic is meta as all crud, and he made this sweet guest strip for me. You should go check out his stuff! I will be back with a new comic for you on Wednesday, 9/21. In the meantime, enjoy the work of our guests!